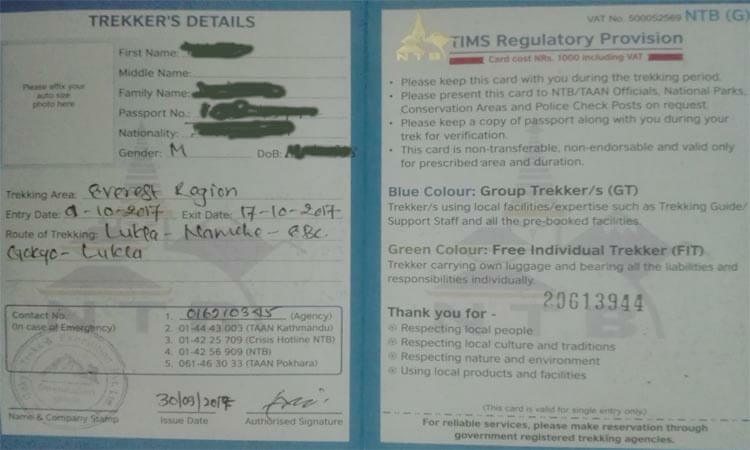 TIMS permit card is for trekker safety and security. The card is a compulsory permit for the Trekkers. It is Trekkers Information Management System (TIMS). The aim of TIMS card is to collect your data where you are going with whom for how many days etc? there are many trekking routes in the same region but the government issue only conservation area permit. Because of this, it is very hard to help if in case need. Free Individual Trekkers can get TIMS cards. They have to go Nepal Tourism Board in Kathmandu and Pokhara office. trekkers should fill up the form with passport photocopy. they must have 2 Passport size photograph as well. they registered trekking company provides the Blue TIMS card. In Tims Card you can see Group trekkers card.